The post below is actually a copy of a weekly e-mail that I send to our staff to promote our Burlington Public Schools Blog which shares the great work going on across our school district. I also try to give a quick technology tip/resource that I think would be useful. It is the 17th post in the series. 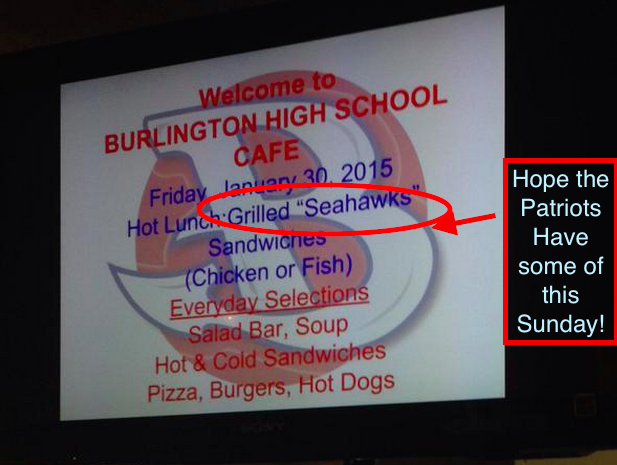 As we head into Super Bowl weekend, I couldn’t help noticing what they served for lunch at BHS today! Go Patriots! We put everything online for free. Teachers know their students best. That’s why we created a flexible resource that works with whatever you’re already teaching. The second digital tool is Citebite a neat little tool that allows teachers to share excerpts from websites with their students through a direct link. The cool part about it is that the link will share the entire article with the excerpt chosen by the teacher highlighted. For an example, Check out my Citebite from a great article on Edutopia’s site discussing the value of a teacher’s time by Jose Vilson.